Let me begin this review of the 2016 Ghostbusters remake by pretending there was no 1984 iteration. How enjoyable would the film be if it didn’t have such enormous baggage, if it didn’t emerge under the long shadow of a beloved predecessor? The answer to that hypothetical is disappointingly prosaic: this is a mediocre horror/comedy that deserves neither high praise nor disparagement. Ghostbusters is pretty much what you would expect from a collaboration between several ex-SNL comedians and the director of Bridesmaids, The Heat, and Spy. It’s fitfully amusing, features decent chemistry among the leads, enjoys two richly comedic performances (from Chris Hemsworth and Kate McKinnon), and is dragged down by an overreliance on special effects and some boring action scenes. Perhaps the thing that hurts Ghostbusters the most isn’t the recasting of the leads but Paul Feig’s decision to spend so much of his budget (and screen time) on battles between the Ghostbusters and their supernatural foes. Because there’s too little humor and even less excitement in those scenes, they offer little more than eye candy and that stuff gets old fast. Did I laugh during the film? Yes. Chris Hemsworth is hilarious - not exactly what one would expect from an actor known for playing hunky roles like Thor and The Huntsman. Kate McKinnon has her moments; her weirdness is occasionally irritating but, more often than not, it adds a spark. (Oddly, the two “big” names, Melissa McCarthy and Kristen Wiig, are almost understated.) The script isn’t as clever as it could have been but it delivers enough laughs to make things palatable. For some reason, however, the filmmakers believe that we as viewers will be excited/astounded by the Ghostbuster-on-ghost action. But 2016 is long past the time when even the most impressive special effects can inspire awe. We expect them. As a result, the lovingly crafted sequences of ghost mayhem in New York City provoke no more than a shrug. And, when it comes to battles, we yawn. It’s not as if we believe any of characters are in danger or that the world might actually end. So why spend so much time and money on the disaster film material? Because they can? Because it’s expected in a summer blockbuster? It drags out the running length and distracts from those aspects of Ghostbusters that work. That brings us to the road-block likely to keep many potential viewers from enjoying anything this film has to offer. This is an unnecessary remake. It’s not the first or last of those. They come along as frequently as falling nuts in the autumn. In this case, however, the filmmakers have (possibly inadvertently) desecrated what some consider to be sacred ground. For me, the 1984 film was nothing more than an enjoyable diversion but, for some of my generation, it’s a seminal movie - a classic that should be approached with care and consideration. Neither of these qualities is evident in this treatment. No one set out to offend fans - in fact, many of the players involved in the original movie are back in one capacity or another. Ivan Reitman is the co-producer and Dan Aykroyd has an Executive Producer credit. Akyroyd, Bill Murray, Ernie Hudson, Sigourney Weaver, and Annie Potts make cameos (along with a bust of Harold Ramis and Ramis’ son, Daniel). The movie tries hard to provide as many call-backs as possible, including homages to some of the original spirits and a nod to the Marshmallow Man. It’s curious why the decision was to make Ghostbusters a “re-imagining” with all-new characters rather than a soft reboot with new characters coming in alongside (to eventually replace) the old ones. As we saw with The Force Awakens, that’s the way to extend a franchise because it excites the fan base rather than alienating them. In a tone-deaf publicity move, certain members of the cast and crew rebutted this hostility by playing the “misogyny” card (and making disparaging remarks about nerds still living in their parents’ basements). Although it’s true that a minority of those lambasting the movie sight-unseen are offended by the gender change of the leads, most are angered for one simple reason: their Ghostbusters are nowhere to be found. The newcomers could have been all male or all marsupial and the reaction would have been as virulent. You’d think people in Hollywood would understand that the best way to inflate the box office isn’t to insult a portion of the potential audience. It’s such a head-scratchingly dumb move that it’s hard to believe it happened. All of this unpleasantness could have been avoided with a more clever script. The leads could have still been McCarthy, Wiig, McKinnon, and Leslie Jones, except now fans would have been able to enjoy the limited appearances of Aykroyd, Murray, and Hudson as “mentors” (and maybe participants in the final battle). No need to change much. So why wasn’t it done this way? Who knows. Hindsight is 20/20 and maybe enough people will be interested in the concept of an all-female Ghostbusters quartet to put aside any reservations they may have. I wish I could say the resultant product was a home run that will make all the concerns invalid. It isn’t. But it’s not terrible and shouldn’t be avoided just because it isn’t a continuation of an old franchise. Reboots happen all the time and, compared to some, this one is relatively successful. The new Ghostbusters work well together. They have a strong rapport and exhibit no difficulty commanding the screen for about two hours. The movie is too long and not funny enough but that puts it in the same category as many recent comedies. My advice is that if you hate the idea of a Ghostbusters remake, don’t see this. There’s no reason to endure a movie you’re predestined to dislike. 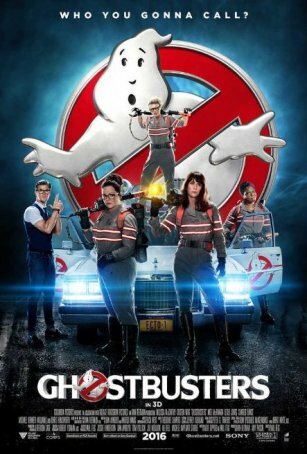 If, however, you have no investment in the original, Ghostbusters will provide what most of this year’s other summer movies have delivered: sporadic entertainment followed by a vaguely hollow feeling that it could have and should have been better.